Heat oven to 350°F. In a medium bowl, stir crushed cereal with butter until well combined. Press firmly into the bottom and sides of a 9-inch pie plate. Bake crust 5 to 7 minutes until lightly browned and set. Set aside to cool slightly. Meanwhile, make the fudge layer. In a small saucepan over low heat, stir chocolate chips and heavy cream until melted and smooth. Quickly pour and spread mixture into the bottom of the cooled crust. 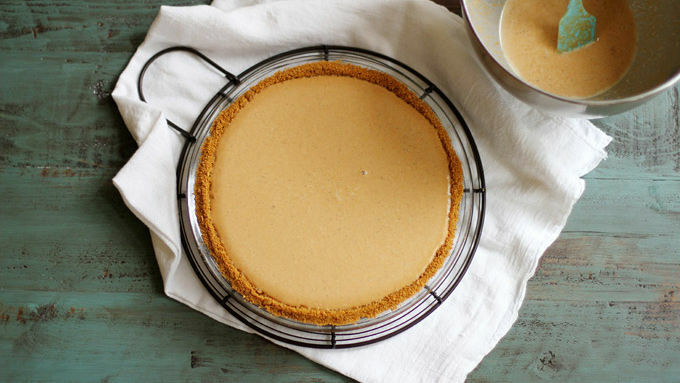 Make the pumpkin pie layer: In a large bowl, whisk together pumpkin and eggs until combined. Add brown sugar, heavy cream, milk, pumpkin pie spice and salt. Stir until just combined. Pour pumpkin batter on top of fudge layer. (Be careful not to overfill the pie plate; you may not use all the filling.) Bake 1 hour until pumpkin pie layer is just set in the center. Cool completely on a cooling rack, then cover tightly with plastic wrap (making sure it doesn’t touch the top of the pie) and chill at least 2 hours, preferably overnight. The next day, uncover the pie and top it with halved jumbo (or regular-sized) marshmallows. Place under the broiler for 30 seconds until the tops of the marshmallows are golden brown and toasted. For a clean cut, run a very sharp knife under hot water for about 30 seconds, then quickly wipe it dry and cut into the pie. Rewash and dry the knife before each cut. Adapted from Love and Olive Oil blog. 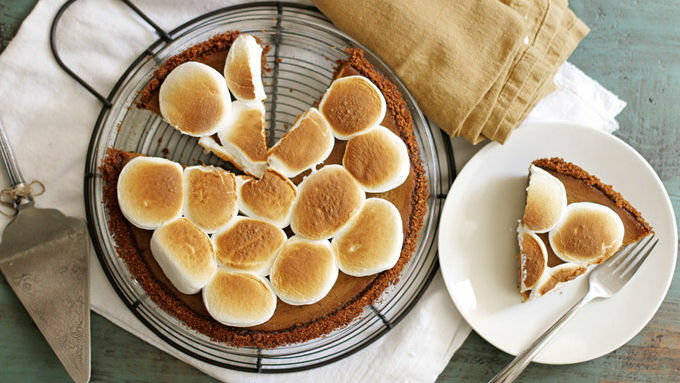 S'mores are hard to resist – especially in pumpkin pie form! This chocolate fudge pumpkin pie with marshmallows twists up tradition in a delicious way. Are you tired of this summer’s s’mores-splosion yet? Yeah, me either. But since it’s officially fall (a.k.a. my favorite season, a.k.a. bring on all the colorful leaves and crisp air and warm drinks and cozy sweaters! ), we’ve got to give the s’mores a little autumn love. That’s where this S’mores Pumpkin Pie comes in. OH YES. You read that right. 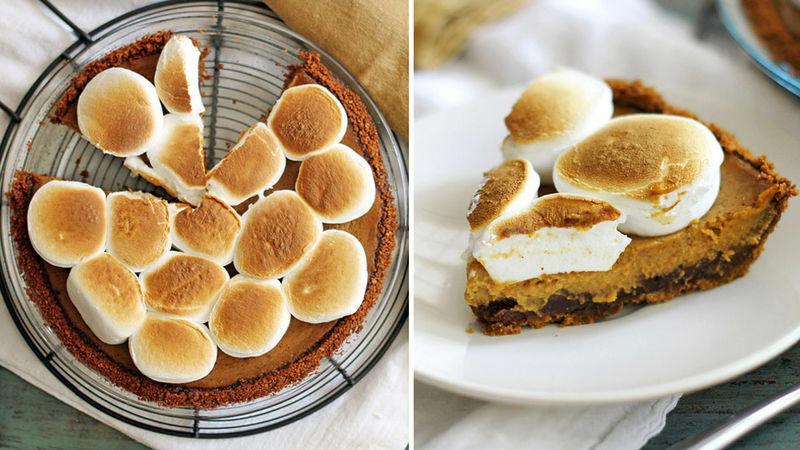 S’mores + pumpkin pie = ahhhhhhhh (that’s a choir of angels singing). 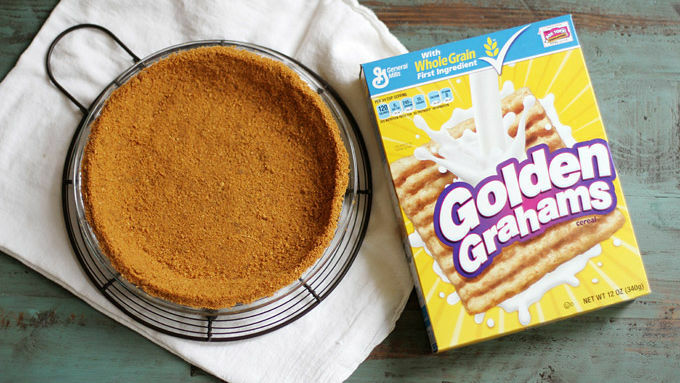 Here’s the deal-io with this pie: There’s a crushed Golden Grahams cereal crust, topped with a layer of fudgy fudge goodness, topped with a layer of classic pumpkin pie filling, topped with marshmallows that are browned and toasted to perfection. I know. I’m drooling over here, too. 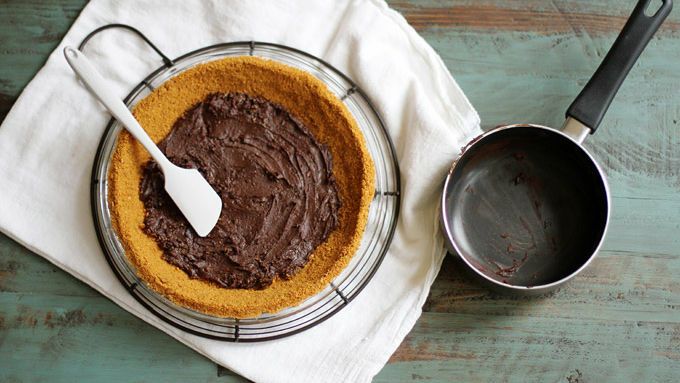 So before we completely lose our minds/drown in our own dribble (ew) over the sound alone of this pie, let’s get our tuckuses in the kitchen and get baking! Slice and serve this fall-ified s’mores-splosion of a pie (my grammar teacher is shaking her head right now). So. Many. Layers. Of. Yum. For a clean cut, run a very sharp knife under hot water for about 30 seconds, then quickly wipe it dry and cut into the pie. Rewash and dry the knife before each cut. Adapted from Love and Olive Oil blog.